Lurgified! | An alien voice under a duvet of dreams. Posted by phoenixaeon in A330, Art, OU, Sick again, The Principessa Files, TMA04, TMA05. Ugh. Struck down by illness again. I hate being sick. Over the last week I’ve been feeling so eugh. Sore throat, stuffed up nose, hackity-mcyackity cough, and just generally washed out. Which means I haven’t been able to properly celebrate another fab result for the mythology course or get down to writing the next essay. OK, the next essay – “Does classical mythology reflect a disposition to explore the realities of the world or a desire to escape from them?” – isn’t due in until April 20-something or other, but I wanted it done by Friday as that is when Princi breaks for Easter. I have got to hope I can tease 1,600 words into a stylish ‘do in two days whilst my sinuses feel like a full nappy! *Sob* But try I will. 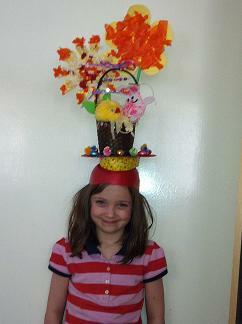 The crazy, monster Easter bonnet. Princi did a lot of the work on this herself – all I really did was build the skullcap base (made from half an old football and a piece of card) and attach the basket. Princi made the flowers, sewed the bunny, spelled out and threaded the ‘Happy Easter’ bead banners, and stuck the eggs and chicks on. Nanny kindly made the pompom chick for her. And to top it all off, she won ‘Best Bonnet’ in her class too! Rock on, Principessa! Anyway, I poured my creative brain into helping Princi with her bonnet, so I apologise for the rather dull post. Hopefully, next time I’m here, it’ll be a bit more exciting.